Projection showing Utah in relation to the rupture direction (solid line; dashed line ±10°) of the Denali fault earthquake (indicated by star). On Sunday, November 3, 2002, at 3:12 p.m. (MST), a large (magnitude 7.9) earthquake occurred on the Denali fault in Alaska. Coincident with the arrival of the seismic waves in Utah around 3:28 p.m., the University of Utah’s regional seismic network detected a marked increase in earthquake activity along the Intermountain seismic belt in Utah. The earthquakes were small-magnitude events (less than magnitude 3.3) generally concentrated in five clusters. 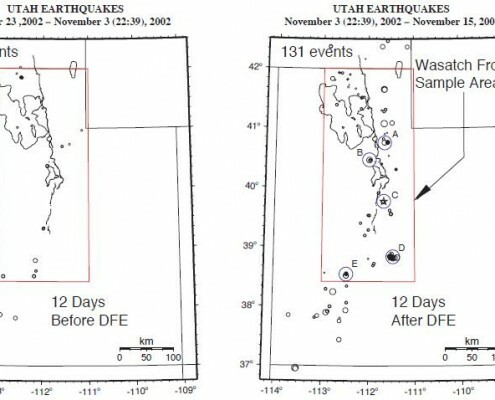 With the exception of a cluster northeast of Nephi (cluster C in figure below), the events occurred in localities with repetitive prior seismicity. The first locatable triggered earthquake was a magnitude 2.6 shock about 12.5 miles east of Salt Lake City. It occurred a little before 3:30 p.m. In the 12 days following the Denali fault earthquake, the mean rate of earthquakes above magnitude 1.5 in the Wasatch Front area increased to almost triple the mean rate for the previous three years. Statistically it can be shown that this rate increase was not due to chance. The first well-documented case of a large earthquake triggering small distant earthquakes was the 1992 magnitude 7.3 Landers, California earthquake. The Landers earthquake triggered small earthquakes up to 775 miles from the source. Researchers observed that the triggered earthquakes occurred (a) in the direction of earthquake rupture, (b) in areas where the seismic waves temporarily enhanced the stress field and (c) mostly in areas of recent volcanic or geothermal activity. 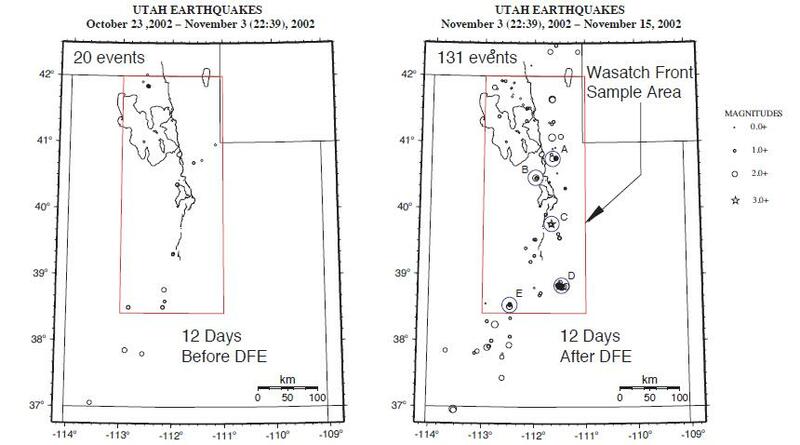 Observations (a) and (b) similarly apply to the earthquake triggering in Utah, but not observation (c) (see below). 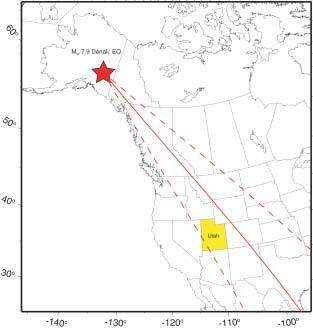 The Denali fault earthquake ruptured in an east-southeastward direction along the Denali fault, and Utah is along a projection of this rupture direction (see figure). Using data from 44 recording sites in Utah, including 38 new strong-motion stations of the Advanced National Seismic System and six broadband stations, we estimate that the temporary increase in the stress field was approximately 100 times greater than the daily stress variation associated with solid earth tides. What makes the observation of triggered earthquakes in Utah distinct from earlier observations is the geologic setting and the large distance (more than 1,850 miles) from the Denali fault earthquake. Remotely triggered earthquakes in the past have been observed chiefly in regions characterized by recent volcanic or geothermal activity, such as Yellowstone National Park in Wyoming, The Geysers in northern California, and Long Valley caldera in eastern California. Further, many of the mechanisms proposed to generate the triggered earthquakes attribute the earthquakes to effects on fluids associated with recent volcanic or geothermal activity. The regions of earthquakes in Utah triggered by the Denali fault earthquake fall into neither of these two categories. By systematically studying these earthquakes, we hope to provide new clues into the dynamic triggering of distant earthquakes. For more information, go to http://www.seis.utah.edu/AGU2002/index. shtml. What About Great Salt Lake? Glad You Asked: Are there glaciers in Utah’s mountains? GeoSights: Pink Water, White Salt Crystals, Black Boulders, and the Return of Spiral Jetty!